Intel does a magic trick today by taking Coffee, waving a magic wand, and getting Xeon E. Ok, we realize SemiAccurate needs to work on our jokes, and we will, but today we talk about a Coffee Lake for workstations. This new line does two things we didn’t think we would say for a long time, it is a good value and it was messaged with actual data. Of the two, SemiAccurate is torn about which one is more monumental, but we are quite pleased to see both. Lets take a look at what was put out and what it means. 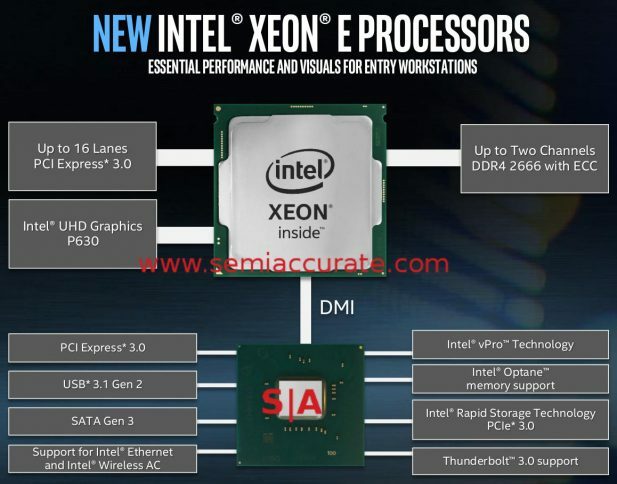 A block diagram of an Intel CPU! If you are looking at the above diagram and thinking, “Wow, that is just a Coffee Lake CPU with one less fuse blown so ECC isn’t turned off”, you would be right. That is exactly what you get, a Xeon-ized version of Coffee. This one is aimed at workstations, Intel wouldn’t comment on future server variants, but you know they are coming in the very near future too. There really is nothing new here technically speaking. If you pick at the SKU list, things do actually get interesting. Why? 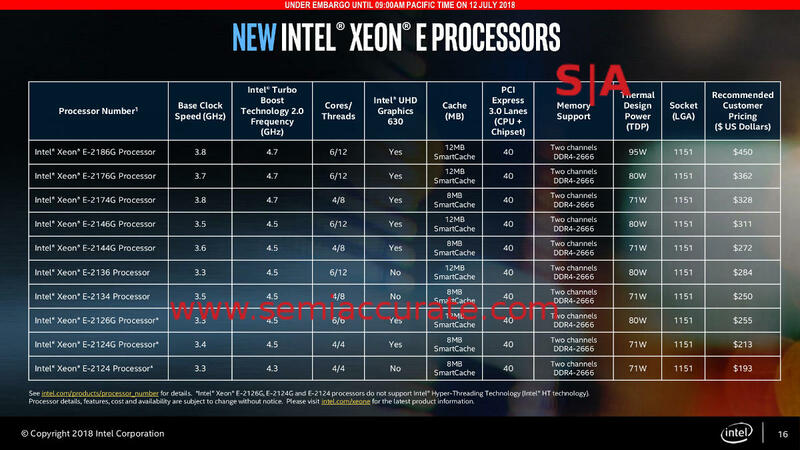 Look at the second from the top part, E-2176G which runs at 3.7/4.7GHz for base/turbo clocks. The closest analog for it is the i7-8700K which runs at identical speeds and has graphics without the P prefix but with the same 630 number. Intel didn’t get back to us in time for publication about P630 graphics speeds and capabilities but we think it is safe to assume that it is just a certified driver version of the 630 at the same speeds. Why is this all important? Price. The E-2176G will cost $362 and the i7-8700K lists for $359-$370 for tray/box pricing. This puts the consumer part at the same price as the Xeon meaning for the same money you can choose an unlocked overclocking part or one with ECC. This latter bit is something most people have been asking for for a long time, unless you really are into overclocking, buy the Xeon. Here is where things get a bit interesting, the E-2186G is 10 better than the E-2176G! Ok it isn’t that big a deal but it does bump the base clock 100Mhz to 3.8GHz and the price goes up to $450. 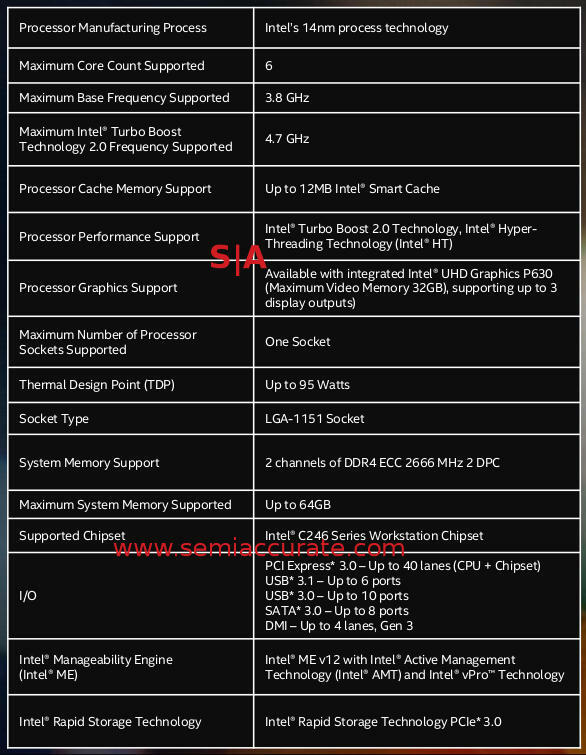 By our math this is now the fastest mainstream Intel CPU out there, 8086K limited edition aside. As long as you don’t need overclocking, well stick with the E-2176G, the 100MHz base isn’t worth the 20% price bump, but it does exist. This is the part where we normally say that the price increase for the Xeon tag and one less blown fuse is not worth the money. In this case there is no price increase and ECC is definitely worth the upgrade. Unless Intel is playing games with chipset pricing to claw back margins through the back door, there is no reason to buy an i7 over an E-2100. Better yet the Xeon line now offers more performance, barely, than you can get in a stock consumer part. Who saw this coming?